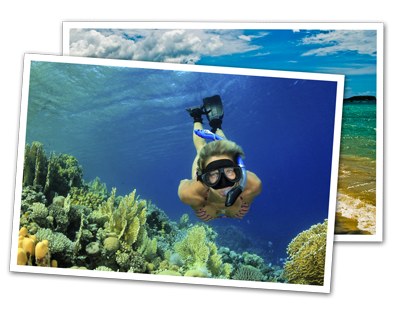 Fin Time Adventures, based in Vieques, Puerto Rico, provides you with adventurous offshore reef snorkeling during your stay in Puerto Rico. These tours of Vieques’ coral reefs offer the opportunity to discover Puerto Rico’s abundant marine life. If your desire is to experience the most beautiful reefs in Vieques, Fintastic is your boat. We are about giving you plenty of in-water time to properly explore what might be the best snorkeling locations that you have ever seen - these are world class reefs. Advance Reservations are Required. Please contact us at 787-981-4109 for private charters or to arrange a combination Snorkel and Fishing Adventure. Routine? A cookie cutter trip is not what we are about. Excitement, extraordinary beauty, and true adventure is what we offer! Fin Time Adventures wishes to bring you nothing but the best. We take site selection seriously. The reefs you will snorkel have been carefully selected to ensure you will see the most abundant marine life locations that Vieques has to offer. We are not limited by vessel speed, which makes the trip quick and easy. Leaving The Old Sugar Pier, the adventure will be a minimum of two snorkel locations. Depending on your desire and sea conditions, a third location will be explored. These reefs are massive! Based on the size of the reefs and variety of marine life, no matter how many times you visit these reefs, the actual exploration will be different. Our experienced water guide will be nearby to provide assistance and/or lead the way. Fin Time Adventures will provide you with all the snorkel equipment you need for the voyage, including sanitized snorkel, mask, fins, and buoyancy compensator vest. If you already own snorkel equipment, you are welcome to bring it along. Snorkeling is fun and requires refueling. For that reason, we provide sandwiches, snacks, and cold non-alcoholic beverages throughout the trip. Bringing aboard other refreshments is OK, as we practice a BYOB policy. For your convenience, Fintastic is equipped with a large ice chest.